The first time Nikki Valens played Arkham Horror, she really didn’t enjoy it. “My largest criticisms were about the ambiguity of the rules and just the sheer amount of small fiddly rules interactions,” she admits. Upon joining Fantasy Flight Games, Valens’ first project was an opportunity to craft an heir of sorts to the studio’s venerated Lovecraftian classic. Eldritch Horror, which Valens codesigned with Corey Konieczka, magnified the citywide battle against cosmic horrors to a global scale, but streamlined elements of the unwieldy gameplay present in Richard Launius’ 1987 co-op board game, itself descended from seminal RPG Call of Cthulhu. Eldritch Horror instantly cemented itself as a modern classic of horror board gaming, spinning off a slew of big-box expansions and serving as one of the strongest pillars of the shared Arkham Horror Files universe. Valens would go on to overhaul Konieczka’s story-focused Lovecraftian haunted house adventure Mansions of Madness in 2016, replacing the first edition’s human GM with a mandatory companion app that would become one of the most applauded – and controversial – examples of the encroaching physical-digital trend. HALLOWEEN SPOOKTACULAR! Betrayal Legacy: Pandemic Legacy and Risk Legacy mastermind Rob Daviau returns to the House on the Hill to tell a spooky story with a personal touch Arkham Horror: Third Edition: The original Lovecraftian board game is back with a bold new vision. Mansions of Madness and Eldritch Horror designer Nikki Valens tells us more about what to expect. Axis & Allies & Zombies: The undead invade World War II in a striking reinvention of the strategy game. We hop in a chainsaw tank and carve our way to the heart of a reborn classic. 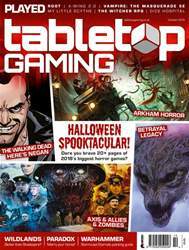 The Walking Dead: Here’s Negan: The comic book’s brutal baddie comes out swinging in a dungeon-crawling board game spin-off of miniatures game All Out War. We join the bloody fight for survival – and reputation. Wildlands: Martin Wallace unleashes his elegant card-driven arena-battler. Could it be slicker than Shadespire? Paradox Interactive: After conquering the PC with its complex historical strategy games, the Crusader Kings studio sets its sights on the tabletop. Plus! How We Made: Sagrada 10 of the Best: Dexterity games All the Jahres: Elfenland Painting Guide: Warhammer: Age of Sigmar Stormcast Eternals Into the Arena: Gladiatorial combat card games Gorus Maximus and Gladiatores go head-to-head REVIEWS: Root Star Wars: X-Wing – Second Edition Vampire: The Masquerade: Fifth Edition Brass: Birmingham The Witcher Pen & Paper RPG My Little Scythe Dice Hospital Remnants Container: 10th Anniversary Jumbo Edition Legends Untold Patchwork Express Stellium Masque of the Red Death Trash Pandas Boss Monster: Rise of the Minibosses Clickbait Senshi Avengers: Infinity War – Thanos Rising AND MUCH MORE!